Serial entrepreneur Abu Omar developed his latest business Cura Systems after witnessing at first hand how hard it can be to help elderly people keep on top of their medications. “I’m one of four brothers, and my mother hops from country to country to spend time with us, and trying to keep track of her medication and visits to doctors – which country, which doctor, what medication does she need to make it consistent – is a nightmare,” he says. 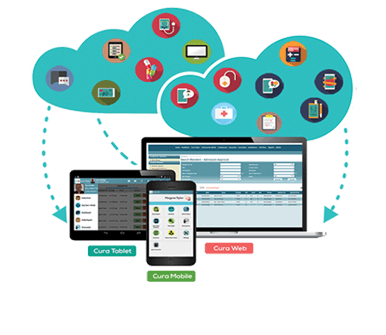 The product is a comprehensive system designed to help care homes manage the needs of their service users and their own planning, including care plans, daily reports, to-do lists, medication management, staff schedules and time and attendance. But starting over again in an entirely new country was a challenge, even for an experienced entrepreneur, and when Abu came across London & Partners he was keen to take advantage of the free support that was available. One of the main priorities for the business at this point was to attract investment, and the programme took Abu through how to pitch for finance. “We were at the point of not being a pure start-up but not being a mature business either; we were right in between and looking for funding,” he says. “The programme looked at how to pitch the business and put the best look forward. I must admit that an old sceptic like me thought they couldn’t teach me anything, but they did.” London & Partners also put the business in front of a number of venture capitalists, although it eventually chose to accept finance from high-networth individuals instead. Now, Abu is starting to think about expanding internationally. It is already selling in its initial market of Singapore, and has ambitions to launch in the US in 2019. “The business is growing exactly as we want it to,” he adds. Give your care home a competitive advantage. Contact the Cura Systems team today on 020 3621 9111. We are confident that Cura will take your service to a new level.